Generations of kids (and their adults) have enjoyed the colorful creations of author and illustrator Eric Carle. From The Very Hungry Caterpillar (and his insatiable appetite) to Brown Bear, Brown Bear (who sees a red bird looking at him), Carle’s many books are filled with memorable words and indelible images. These two-dimensional creatures will be brought to three-dimensional life on Sunday, Feb. 24, in the RCU Theatre at the Pablo Center at the Confluence in Eau Claire. 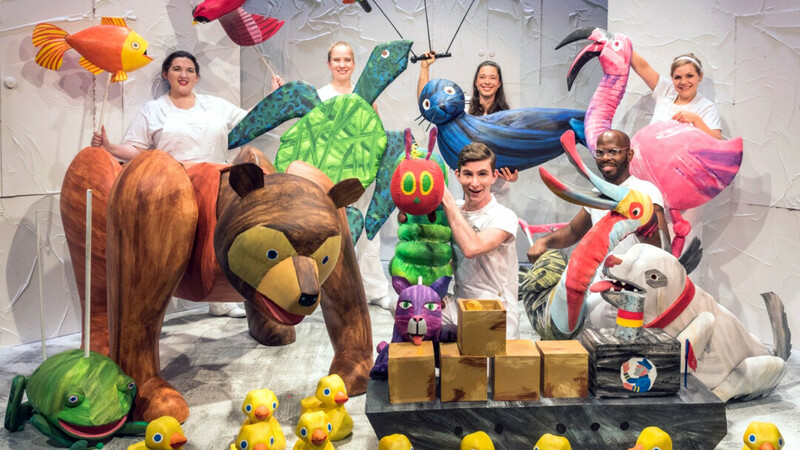 The Very Hungry Caterpillar Show, created by Jonathan Rockefeller, is a faithful adaptation of several stories by Carle, and features 75 puppets who bring to life not only that voracious caterpillar but the stars of 10 Little Rubber Ducks, The Very Lonely Firefly, and others. The show made its debut in 2016 in New York, where it had a record-breaking eight-month run. Since then, it has toured the world, drawing rave reviews on both sides of the Atlantic. If you’re looking for a way to give your little person an appetite for live theater at the Chippewa Valley’s newest, grandest venue, The Very Hungry Caterpillar Show will be a tasty place to start.